A man thought to be the oldest living person in the world is celebrating his 116th birthday. Hryhoriy Nestor was born in what is now Ukraine. 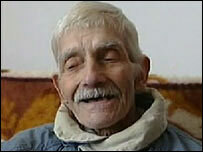 The authorities are to mark the occasion by officially recognising him as the oldest person in Ukraine. They say they have documents that prove that his birthday is on 15 March 1891. An attempt is now being made to get him into the international record books. Hryhoriy puts his long life down to the fact that he has never been married. To mark his birthday, Hryhoriy Nestor is having a small party - just a few friends and family will gather at his home. Unlike many people from his village in western Ukraine, Hryhoriy has survived a brutal dictatorship, wars and grinding poverty. In the past, the area was ruled by Poland and the Soviet Union. But the 116-year-old says that life was best when the region was part of the Austro-Hungarian Empire a century ago. It was only at the age of 100 that he retired from working as a farm labourer. He is now looked after by a relative. Hryhoriy, who still has a full head of hair, says that being single has kept him feeling young. He recommends a diet of milk, cheese and potatoes as well as the occasional shot of vodka.